Seldon Core extends Kubernetes with its own custom resource SeldonDeployment where you can define your runtime inference graph made up of models and other components that Seldon will manage. A list of Predictors, each with a specification for the number of replicas. Each defines a graph and its set of deployments. Multiple predictors is useful when you want to split traffic between a main graph and a canary or for other production rollout scenarios. For each predictor a list of componentSpecs. 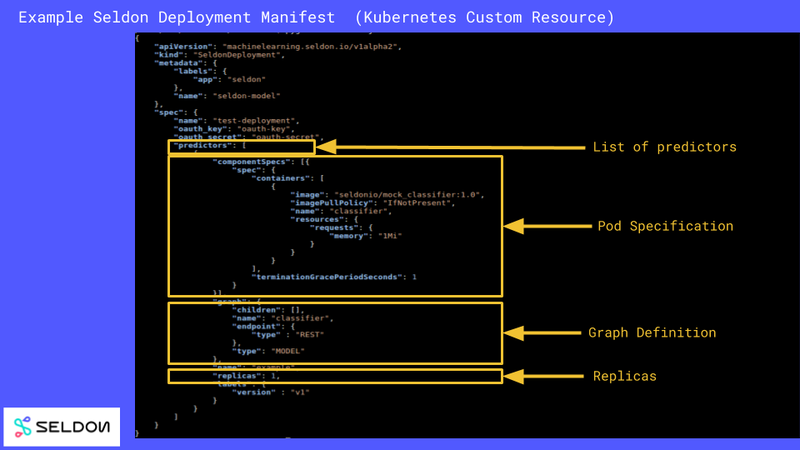 Each componentSpec is a Kubernetes PodTemplateSpec which Seldon will build into a Kubernetes Deployment. Place here the images from your graph and their requirements, e.g. Volumes, ImagePullSecrets, Resources Requests etc. A graph specification that describes how your components are joined together.